Make a statement and enhance all communication using rich media that inform, instruct and inspire. Digital signage allows you to make a stunning and lasting impression giving you versatility in capturing your audience. Use digital signage in corporate buildings, hotels, restaurants, hospitals, college campuses, and more. Digital signage is the sharing and playback of digital content using LED and panel screens to display images, HD video, information and streaming media. We offer complete digital signage solutions from displays and servers to content management systems allowing you to schedule and manage one or multiple screens. 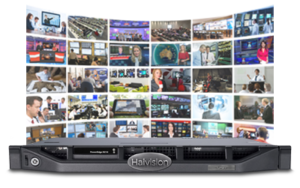 Products such as Brightsign and Haivision, which bring together central management and control with Coolsign digital signage platform and the Furnace IP video system are just examples of the solutions we offer. Every aspect of your business can be improved with the assistance of visual communication. Digital signage is a great tool for engaging and delivering targeted messages to specific locations at specific times. Why Hire Philm Gear for your digital signage needs? We are experienced in delivering the very best in custom solutions. We’ve delivered outstanding results for Corporations, Universities and many others. We make it simple to outfit your organization with your digital signage needs. Are you in need of digital signage?